Combining the sporty style of a wristwatch with the functionality of a smartwatch, this Garmin smartwatch tracks steps, monitors sleep, alerts you of messages and social notifications and syncs with the Garmin Connect mobile app to let you view your stats in full. Finished with a smart black silicone strap, this smartwatch will keep you prepared for any adventure. 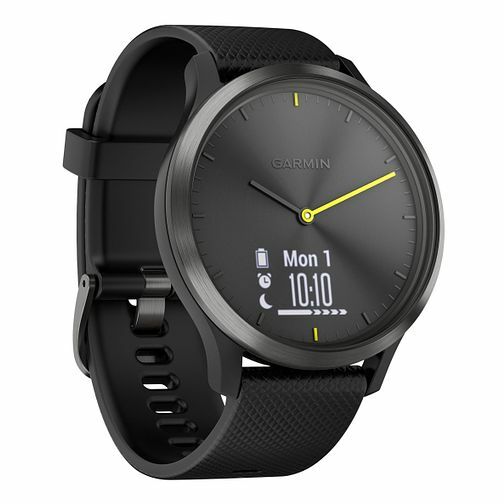 Garmin Vivomove HR Sport Black Silicone Strap Smartwatch is rated 4.6 out of 5 by 9. Rated 5 out of 5 by Anonymous from Great piece of kit. I’ve used a number of Garmin watches and they usually look like fitness equipment. The vivomove looks like an analogue watch but has a digital touch screen too. It has majority of the functions you get with fitness trackers and links to the Garmin app easily. Alternative straps are available and it is easy to changed from a silicone strap to leather which transforms the look of the watch. The only thing it doesn’t have is GPS so it won’t track/map your running or cycling etc and it’s not compatible with things like footpod, but as the design would suggest its more for general use and activity tracking there are other products such as the forerunner range for more sports specific exercise. Rated 1 out of 5 by Anonymous from Pairing problem with iPhone I was unable to pair the watch with my iPhone as it wouldn't "see" the phone. Unfortunately therefore I had no choice but to return it. H Samuel was totally fuss free and refunded me immediately.